An Intrusion Detection System is a software that monitors a host and notifies you of suspicious activity, in this case your WordPress website. Such suspicious activity can be a sign that attackers are trying to find a security hole to exploit on your WordPress website, or have already hacked into it. It is of utmost importance to be notified as early as possible about possible attacks, so you can take the necessary evasive actions to thwart the attack, or to limit the damage in case of a successful hack. This article explains how you can build an intrusion detection system for your WordPress websites and WordPress multisite network with the WP Security Audit Log plugin, WordPress’ most comprehensive audit trail solution. Use an automated scanners (such as WPScan) and scripts to scan your website and detect possible old and vulnerable plugins, themes or WordPress core. Use automated software to launch a dictionary / brute force attack against your WordPress website and try to guess weak credentials. Alert 6023 for 404 errors generated by anonymous users. So you can easily identify automated scans in the WordPress audit trail, as per the below screenshot. The plugin can also log all the HTTP 404 errors to a log file. By analysing these log files you can learn about the type of attacks or vulnerabilities attackers are trying to find and exploit on your WordPress website, thus allowing you to better protect your website. The WP Security Audit Log plugin can alert via email when your WordPress is being scanned for vulnerabilities. To receive such alerts simply enable the 404 HTTP errors alert from the Recommended Email Security Notifications tab in the Email Notifications menu node, as shown in the below screenshot. WordPress Security Tip: Here are some tips on how you can secure your WordPress administrator user. Alert 1003 for when someone tries to login to WordPress using a non-existing user. Alert 1002 for when someone tries to login using an existing user. 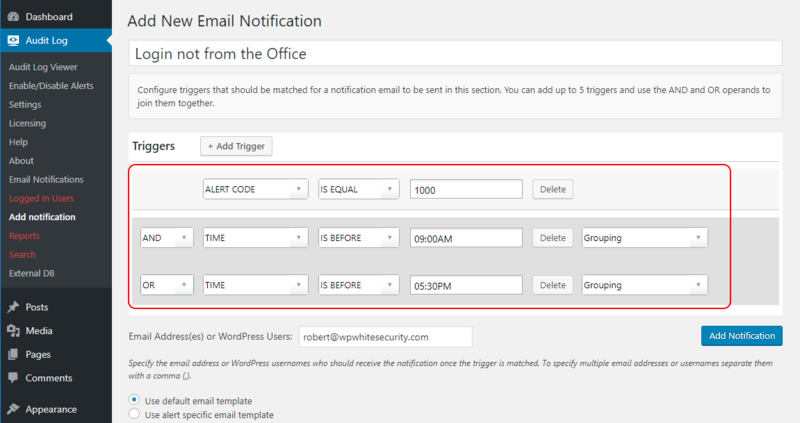 Similar to what we have done to get notified of automated scans, you can use the Email Notifications add-on to be alerted instantly via email when there are failed login attempts on your WordPress. As per the screenshot below, you can enable either one of the rules, or both. Personally I wouldn’t be really bothered about failed login attempts of non-existing usernames, but I would keep an eye on failed login attempts using existing usernames, as explained in Dealing with Failed WordPress Logins. There is no bullet-proof WordPress security solution. You can have the best WordPress firewall and security plugin, though your WordPress website can still get hacked. Therefore it is imperative that you also think of being notified should the worse happen, when your WordPress is hacked. The earlier you find out about a hack, the easier the recovery process will be. Let’s look into how we can use the Email Notifications in WP Security Audit Log to be alerted of any of the above changes, so we can catch hackers red handed and limit the possible damage. Below is a screenshot of the configured email notification trigger. A hacker can also create a new WordPress user directly in the database, maybe by exploiting a SQL injection vulnerability, or by gaining access to the database via other means, such as phpMyAdmin. In such case you can still get notified of such activity by enabling the notification Alert me the first time a user logs in in the WP Security Audit Log Email Notifications. Below is a screenshot of an email notification, alerting the WordPress administrator that a user logged in to the WordPress website for the first time. A WordPress user installed or activated a plugin. Browse through the list of changes that the plugin can keep a record of for more ideas on what type of email notifications you can configure to be alerted of possible suspicious activity. By investing some time in understanding how your WordPress website is being used, you will be able to configure a solid WordPress Intrusion Detection System that can help you prevent possible attacks and save you on a rainy day. Take all the other necessary security precautions as explained in the WordPress security wheel and you should be able to tighten the security of your WordPress website, thwart possible hack attacks before they happen, and in an unfortunate event, act as soon as possible to limit the damage.